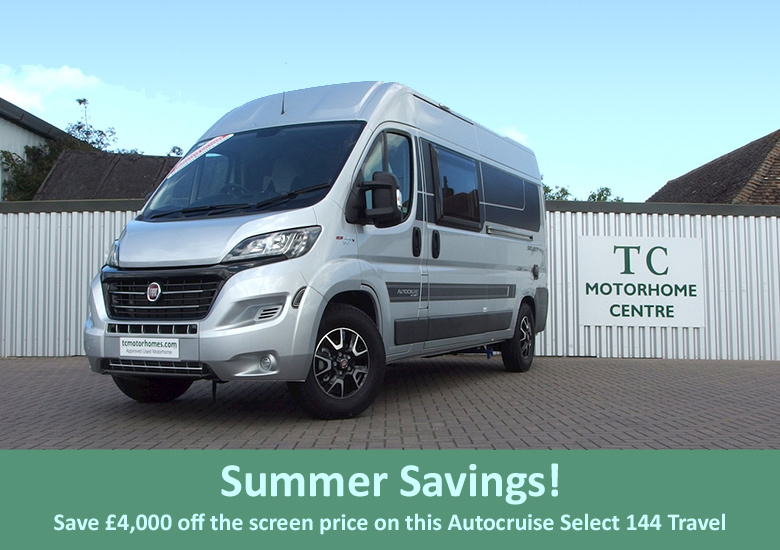 We have got in the spirit of summer and have 4 Autocruise Motorhomes on offer, each with £4000 off the marked price! To view the full list on our website visit: Summer Autocruise Savings. The autocruise 144 with travel option (seat-belts for rear passengers) is a 3 x berth but has 4 x seat-belts, compact van conversion with an excellent but shrewd specification. It`s got the things you want and need. 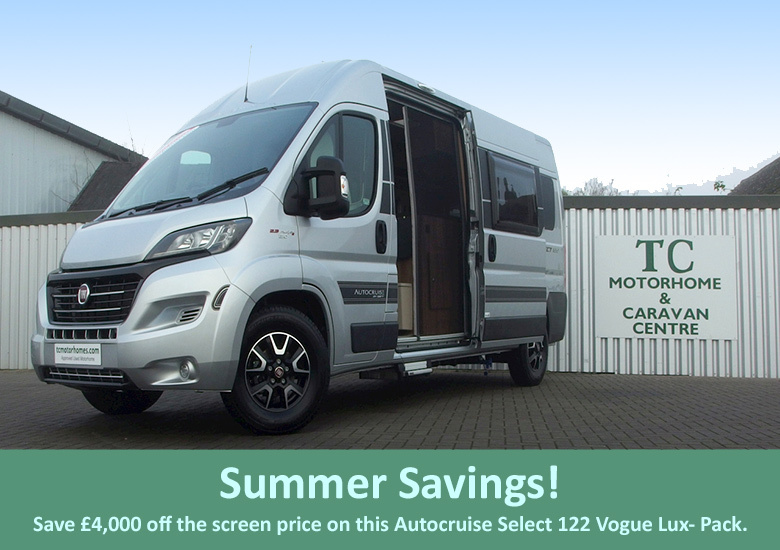 To find our more about this Motorhome or to make an enquiry please visit: Autocruise Select 122 Vogue Lux- Pack or call our showroom on 01227 289111. To see the other Autocruise motorhomes that are on offer please visit Autocruise - Immediate Delivery New Motorhomes. The autoquest 184 travel is a 4 x berth van conversion, which looks very stylish and attractive and yet is also immensley practical and versatile. At just under 21 feet in overall length, and 7` 5" in width you can take it places where you cant take a coachbuilt motorhome, and enjoy the excellent driveability that the select 184 delivers. 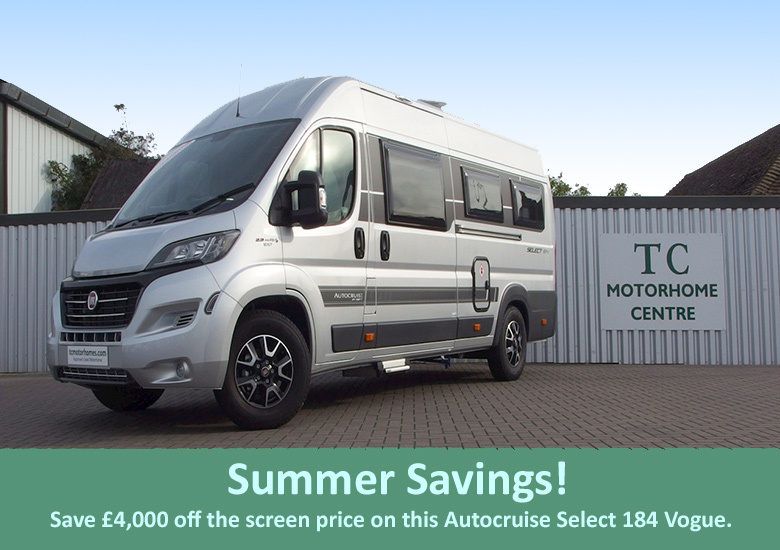 To find our more about this Motorhome or to make an enquiry please visit: Autocruise Select 184 Vogue Special Offer or call our showroom on 01227 289111. This is the Autocruise Select 164 Van Conversion Motorhome. Capable of accommodating 2 x persons in comfortable, attractive surroundings, with an excellent factory specification, that includes lots of safety features and creature comforts. The fixed `french style` double bed uses the impressive `duvalay duvalite` mattress for the ultimate nights sleep, with good storage beneath. The SELECT 164 has a well equipped, functional galley, with a Smev 2 x gas burner hob, grill and separate mains operated Microwave oven (Fitted only when the Comfort Pack is specified). 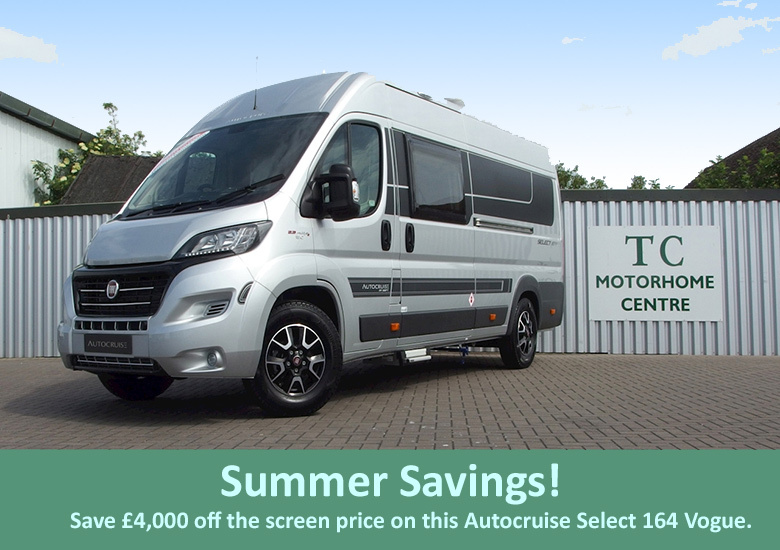 To find our more about this Motorhome or to make an enquiry please visit: Autocruise Select 164 Vogue Special Offer or call our showroom on 01227 289111. Autocruise Select 122 Vogue which includes the Lux- Pack. This 2 berth Autocruise Select 122 Vouge, with rear lounge van conversion, with factory specification which includes; the living, the luxury, the drivers, and the vogue packs. This includes such things as cab air-conditioning, cruise control, metallic silver paintwork and much much more. It also has the upgrade engine/power unit which is the 2287 cc / 130 BHP Euro 6 Engine.